For chic summer style, it really doesn’t get any better than maxi dresses! They’re so easy to throw on and go and can easily be worn in the most casual or dressy occasions! From beach days to running errands to weddings, every women should have a few chic maxi dresses in her wardrobe! Today I’m sharing my top picks under $50. Get ready to transform your wardrobe on a budget! If feminine and flirty is your style, there are an abundant amount of pretty floral print options for you! #12 has the prettiest faux wrap style that is flattering on so many body types! It also has the sweetest shoulder ties, making it feel ultra feminine! #1 is a great versatile option that comes in so many different colors and prints! I love the black and white version, but it also comes in a tropical palm print that’s equally as fun! And #7, although a little more midi-cut, is a show-stopper! It’s also under $30, making it a can’t-miss! If you favor classic, timeless options, you really can’t go wrong with a solid maxi dress! For everyday wear #15 is a must-have! It’s a great basic that could be layered with tees, jackets, or kimonos. I also really love the off shoulder style of #5, which comes in two other colors, including a mocha and dusty pink! The straps on #13 are so unique, and the tiered skirt is another great detail. Even though it comes in three solid colors, it’s far from boring! #2 also comes in a sunny yellow and would be so flattering on many body types! With the empire waist, it could even work with a baby bump! From vacation days to everyday errands these options will keep you going in easy, breezy style! My favorite is easily #4 because it comes in eight different gorgeous print options! Whether you favor brights, muted colors, or neutrals, you’re bound to find an option you love! If you love cut-out details, check out #10! It has the cutest little peekaboo detail and a strappy back! It’s definitely my top pick for the beach! I also love the vibrant color of #14. Even though it’s strapless, the ruched bodice will keep it in place throughout the day! If you have any events or just want an option you can dress up a bit, off shoulder options like #6 or #11 are so elegant. #3 has the most beautiful embroidered top, and with the ruffled waist, it almost appears as if it could be a chic skirt and top combo! The dressiest options are easily #9 or #8. For weddings or other special occasions, you really couldn’t go wrong with either of them! 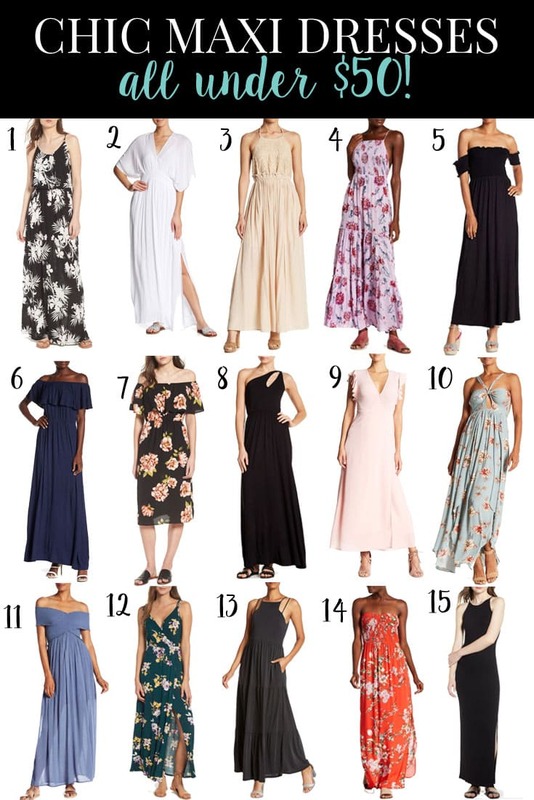 Do you live in maxi dresses during the summer? Which one is your favorite? !